I have a kitchen bookcase dedicated to cookbooks. I confess to also having overflow in second and third locations. New publications need to pass close scrutiny before they win a space in my collection, but I do have favourite authors whose writing and recipes I love. They gain automatic entry. I’m guilty of under utilising my cookbooks and regret that I neglect them. I tend to be lazy when cooking week night meals. Tiredness and lack of time drive me to seek solace in the comfort of dishes that require little thought and even less effort. In a quiet New Years resolution to myself I promised to make the effort to use my cookbooks more frequently, to try some of the recipes that I marked with post-it notes before the book was parked on the bookshelf. These pages are the perfect platform to keep me on the straight and narrow. I’ll endeavour to regularly cook and write about a new dish I’ve tried. Today is the first post to honour that commitment. As the chef of Melbourne’s very first gastro pub Greg Malouf single handedly introduced Melbourne to the exotic flavours of the middle east. I’m not talking about rustic home style felafel, and tabbouli but finely crafted dishes that incorporated the ingredients and techniques of his heritage. Malouf’s departure from Melbourne left a pool of upskilled young chefs and disappointed diners, but thankfully he turned his absence into a blessing and gifted us all the resources to make food á la Malouf by referencing his sumptuous coffee table cookbooks, Saha, Saraban and Turquoise. I cooked Malouf’s recipe for Baked Yoghurt Rice with Chicken without deviation from the published recipe, however I have clarified the writing of the method. Flicking back and forth between recipes while mixing the marinade for the chicken and preparing the rice Persian style annoyingly interrupted my workflow, but having said that the dish was very simple to prepare. The finished dish was very mild in flavour, almost bland, however the texture was delicious, the rice having maintained it’s form and texture. The saffron was just discernible, the taste of orange totally lost. It’s rare for me to season food on my plate but I added both salt and pepper at the table. The major upside was that the chicken and rice made a great vehicle for eating delicious thick natural yoghurt and fresh herbs. Would I make this dish again? The ingredient list and the ease of preparation created expectations. I confess to feeling disappointment, but I will try again and add some garlic, a little chilli, more salt and extra orange zest. Mix together the marinade ingredients, then stir in the chicken so it is well coated. Cover and refrigerate the chicken in the marinade for at least 2 hours, or overnight. Wash the rice thoroughly, then leave it to soak in a generous amount of water for 30 minutes, swishing it around with your fingers from time to time to loosen the starch. Strain and rinse the rice. Bring 2 litres of water to the boil then add the salt, then stir in the rice. Return the pot to the boil and cook uncovered for 5 minutes. Generously butter a 2 litre ovenproof dish. Use a slotted spoon to remove the chicken pieces from the marinade, then mix half the rice into the marinade and spoon it into the buttered dish. Spread the rice over the base and up the sides of the dish. Arrange the chicken on top in a flat layer then spoon the remaining rice on top, spreading it with the back of a spoon to cover the chicken and make it flat on top. Lay a sheet of lightly buttered baking paper over the rice then cover tightly with aluminium foil. Remove the dish from the oven and dot the surface with butter. Replace the foil and leave to rest for 10 minutes. Use a spatula to loosen the rice from the sides of the dish, then turn it out onto a serving platter. Serve with thick yoghurt and a generous scattering of roughly chopped fresh herbs. A completely new one on me Sandra. Very nice. I too have many cookbooks, and don’t cook from them often enough. I tend to take pictures of recipes and save them in Google Keep. That way if I’m feeling like a particular dish, I can easily find it again. This is one of my favorite Persian dishes. We have small Iranian take away in town that does a wonderful job with this. I love it with Muhammara sauce. Had to laugh when I read your comment about the Post-It notes as I also do the same. If you peered at my cookbook shelves you see green Post It notes coming out of the top of books. That means I’ve cooked and liked it. Pink mean “not again” and blue is “want to cook”. That’s interesting, I ate a similar recipe at a friend’s house and although I enjoyed it, it tasted a bit like nursery food (ie bland). I’d be tempted to chuck in some spices, I think. Yeah, it needs something, spices would be perfect.. I have made a very similar dish with a flour tortilla under the rice, it gets crisp and delicious as everything bakes. I am surprised it was bland though. Although there isn’t any salt in the marinade, that could be a mistake. Maybe using mostly thighs? And I agree, more orange. I would imagine the orange flower water is completely lost. Maybe replace with orange juice concentrate? I love the Persian slant of the recipe. Bad recipes are annoying, aren’t they?!! I used to do the same thing with cookbooks, but with blogging i’m motivated to look through old cookbooks. But it helps that I’m retired. Sounds like you work full time. Have I told you that I love your new photo? Thanks Mimi. I’m retired too but find my days are incredibly busy, I wonder how I ever had time to hold down a job. This is comfort food at its best. I also have Saraban and admit now that I have never cooked from it, just drooled over the pages. I will make this recipe and get the book off the shelf. I like your resolution. My cookbooks are now in two different countries, in a variety of bookshelves – kitchens or otherwise – wherever they fit. There is also a library of duplicate cookbooks on my iPad. Too many places… I dream of a large kitchen library where they can all be reunited. One day it may come true. I have recipes saved electronically all over the place, I really should get some system going. I love my books and find cooking from a book works much better for me than having to look at a screen. The bookmarks are numerous…. Those electronic files are hard to organise. Sometimes I have to look through numerous places on multiple devices before I simply give up and do a google search! If you come up with a solution, let me know. Cookbooks are much better! I tend to rely on lovely blogs like this these days for inspiration! 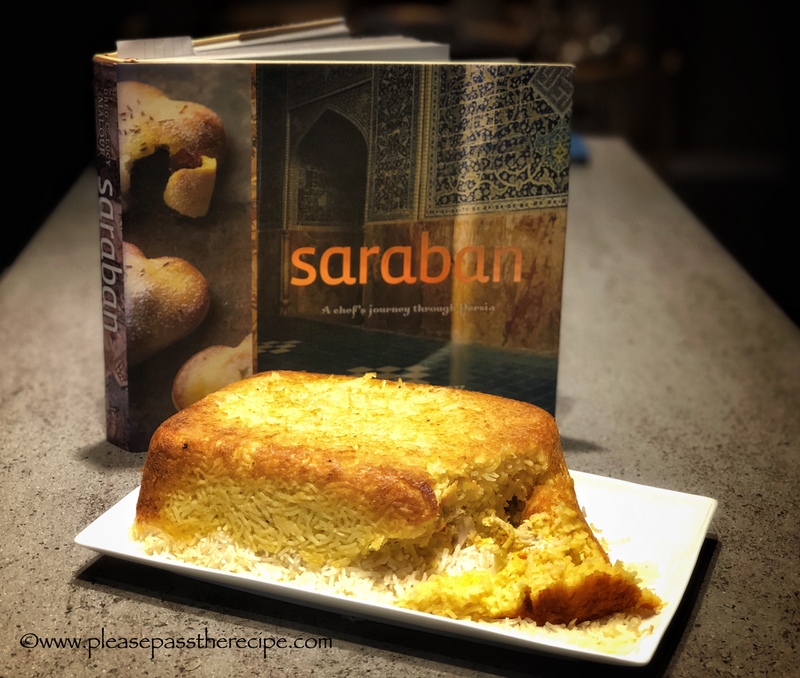 This entry was posted on January 25, 2018 by ladyredspecs in Chicken dishes, Cooking, FODMAP diet, Food, Gluten Free, Main Meals, recipes and tagged chicken, FODMAP diet, gluten free, Greg Malouf, Persia, rice, Saraban, yoghurt.